I’m reading Alexandra Horowitz’s new book, Being a Dog. I’ve just started it, so the review is a ways off. But it’s good. It focuses on smell. How it feels to live your life, as dogs do, in a world dominated by smell. I’ve read a lot of her work — she’s the researcher who debunked the “guilty dog” look, for example — as well as just about anything else about dogs that I can get my hands on. I know, from listening to the “Fresh Air” podcast where Terry Gross interviewed Horowitz (it’s called “From Fire Hydrants to Rescue Work, Dogs Perceive the World Through Smell”) that dogs don’t necessarily categorize smells as “good” and “bad.” They just are. This seems evident when we think about the things that dogs spend the most time sniffing … but I digress. 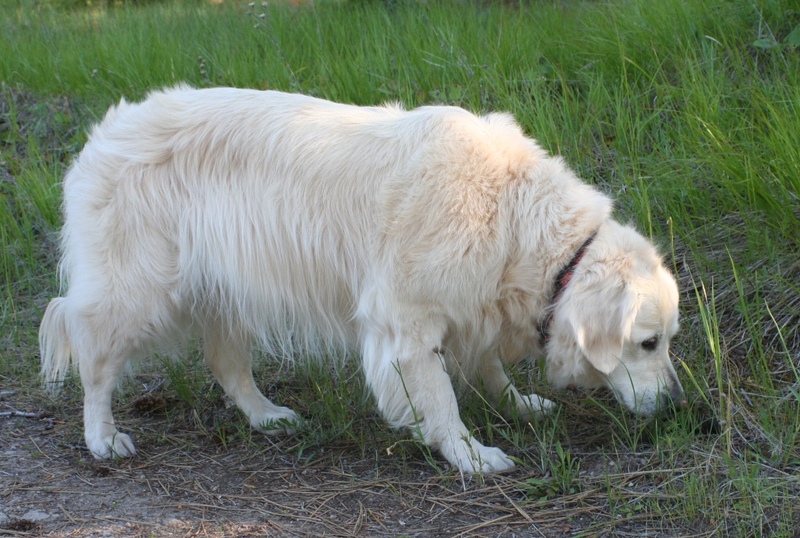 Horowitz describes something that she calls “smell walks.” And, while I have never seen or heard such a specific description of a “smell walk,” I have actually engaged in something similar with my dogs for years. The idea is that the walk is the dog’s time to catch up on the important news of the world. Dogs do this by sniffing. In Jana’s case, this requires sniffing every blade of grass, twig, stone, or millimeter of sidewalk. These are very slow walks. In fact, they are not walks so much as “stand here awhile, move a foot or so, and stand there awhile, then repeat”s. But that is kind of a mouthful, so we’ve stuck to the wishful shorthand of “walks.” My version has been to let the girls (Jana) sniff on the way to the park and at the park, then actually walk on the way home. I’ve had mixed success with this approach. Jana has a very strong and effective set of brakes. But now I feel guilty even about that (the “walking on the way home” part). I’m not far enough into the book to know whether all walks have to be smell walks or just one a day, or what. I also don’t know whether there is ever justification for breaking the rules. Because, you see, what I do know is that pulling the dog away from what she is sniffing is not allowed on smell walks. Another missing piece of information (because Terry Gross didn’t ask) is this: When the dog progresses from smelling to tasting, has the dog broken the rules? And if so, is pulling her away and reprimanding her permitted? If not, how do we keep her from eating really sickening things (in both the “I find it gross” and “it will make her sick” senses of the word)? Horowitz does not have a golden retriever or a Lab, so she might not have this problem. Still, I would love to hear her answer. I am hoping to find it in the book. In any case, the idea is to let the dog sniff to her heart’s content. With this approach, Jana and I might never actually get across the parking lot to the sidewalk ever again. I don’t follow this rule. Horowitz warns of dire consequences: Pulling dogs away from smell-rich environments might make them lose their predisposition to smell. This is why, she theorizes in the interview, dogs started attending to pointing and other gestures. I have lots of thoughts on that (based on lots of research) but suffice it to say that Jana, the heavy-duty sniffer, does really well with gestures and pointing. And Jana has survived 13 years of being pulling contests, where her brakes often defeat my efforts to separate her from whatever she is sniffing. Cali, whose nose just might be broken, never got the memo that said dogs, even very young puppies, attend to human gestures, follow pointing, and attribute some significance to the way the human is facing, pointing and gesturing, especially when all three match up. Maybe Cali is secretly a wolf. Or a chimpanzee. They don’t follow gestures either. The first chapters of Horowitz’s book talk about how delightfully smelly humans are and how dog noses work. It also describes how dogs’ self-awareness is defined: by their scent, of course. I’m really enjoying the book, even if it has triggered enormous guilt about the walks. I’ll have to keep reading to see if and when I am allowed to take the dogs on what Jana calls “forced marches” — no-sniff walks with the goal of exercise or getting somewhere (or both). At least Cali enjoys those! You are such a great writer and your posts crack me up! I look forward to them each week. It is my understanding that the sensory abilities of a dog, as awesome as they are, are proportionately draining on the dog’s resources. i.e a dog will tire itself by sniffing, just as much as it can by walking. Our Ray is an ardent “sniffer” and, given that the walks are primarily for his benefit (anything we gain from them is secondary), we tend to let him sniff away for as long as he wants to. After a walk with much sniffing and minimal distance covered, he will return home quite exhausted! It bothers me when I see dogs being dragged along, on some pre-determined walk that is presumably convenient to the human on the other end of the leash, while the dog clearly wants to “stop and smell the roses”! I think that is true; the stimulation and benefits of a smell walk are similar to the benefits of giving the dog a mental challenge — a food puzzle or playing hide and seek (which after all is a smell game …). I need to find a balance that gives the girls their smell time while also getting all of us much-needed exercise.